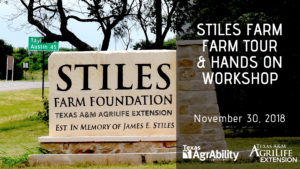 Join us for a farm tour of Stiles Farm in Thrall, Texas. The Stiles Farm Foundation is a 2,716 acre farm located in Thrall, Texas in eastern Williamson County. The farm is managed by the Texas A&M AgriLife Extension Service as a living demonstration of research-based, profitable, and environmentally sustainable agricultural practices for the Texas Blackland Prairie. Tyler Coufal, Williamson County Extension Agent, will be putting together some hands-on learning activities and a farm tour of the Stiles Farm.